Opel soars 62% year-on-year with the Grandland X up 122 spots on February. The Romanian new car market continues to gallop well ahead of its 2017 level this year with March deliveries up another 17.4% to 8.122 units, leading to a Q1 volume up 28.6% to 28.643. Brand leader Dacia outpaces its home market with a 22% year-on-year gain to 23.4% share vs. 26.9% (+4%) so far in 2018. Ford is back up two spots on February to #2 despite dropping a steep 25% year-on-year. It distances Volkswagen (+31%), Skoda (+26%), Opel (+62%) and Renault (+21%) all beating the market. BMW (+56%) also shines inside the Top 10 while outside, Smart (+550%), Ssangyong (+300%), Mini (+178%), Alfa Romeo (+125%), Porsche (+100%), Mazda (+118%), Suzuki (+96%), Nissan (+76%), Audi (+51%), Fiat (+45%), Volvo (+45%) and Citroen (+31%) all stand out. Model-wise, the Dacia Logan (+14%) trails the market but celebrates 163 consecutive months at #1 while the Dacia Duster surges 46% in 2nd place ahead of the Skoda Octavia (+1%), Ford Focus (-57%) and VW Golf (+120%). 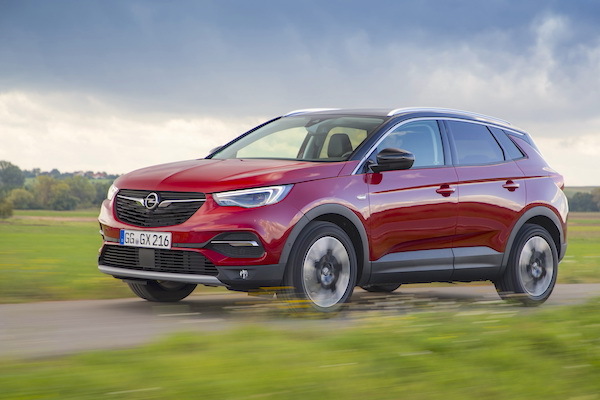 The Ford Kuga (+199%), VW Jetta (+150%), Renault Megane (+55%), Opel Astra (+541%) and Suzuki Vitara (+45%) also impress while the Opel Crossland X top recent launches at #35 followed by the Opel Grandland X at #36 (+122), the Skoda Kodiaq at #39 (-10), Skoda Karoq at #54 (+35) and the VW T-Roc at #55 (+32). Full March 2018 Top 40 All-brands and Top 250 All-models below. Romania July 2011: Dacia Duster at its highest!